Below is a table that lists in Euros the cost of the transfer fees that made up the current squads of the main European leagues. Of course, some of these transfer figures will no doubt be estimates, as we’ve seen from Lambert’s own mouth some of the fees that Villa have been reported to have paid a wide of the mark, so no doubt the below isn’t an exact science. Still, it’s a decent enough guide. A Villa fan Ollie Good posted the table on Facebook today, so we don’t know the source of it, but thought it was worth posting for you to take a look at. Take out the cost of Villa’s fees for Darren Bent and Charles N’Zogbia (around € 36 million), who don’t really feature in the current squad, and things get really interesting in terms of comparisons to the rest. According to our maths, Villa would probably be in 16th place just above Hull. I assuming the figures below don’t count this January window, so that would put Villa actually below Hull with Steve Bruce signing up the services of Shane Long and Nikica Jelavić for a combined total of around €16 million. Certainly Stephen Ireland’s signing on transfer fee value (around €9-10 million), would also be deducted and push Villa even lower down the table. This totally disregards the fact that villa have one of the most successful academies in the premier league and that many of our squad have come through it, it doesn’t factor in the value of those players so is obviously skewed towards teams who have not focused on youth policy. This is marginally interesting but needs to be looked at in a much broader context. Shocking to see that Villa’s current squad cost more than Athletico Madrid’s. Pretty much meaningless as it is. Why do villa get to deduct transfers for players who turned out to be duds? I understand that they’re not in the squad, but what about other teams? This website is obviously from the POV of Villa. It’s just a quick post and the Villa points are worth a mention considering the expense of those two players. We’re not that interested in breaking down every team, but not many teams have had a ‘bomb squad’ like Villa, where a manager’s just refused to play high transfer fee costing players. It’s fine that the blog is from Villa’s point of view, but Skunk Features is right; you can’t treat Villa as a special case. If you’re going to make exceptions for Villa you have to do it for all teams. 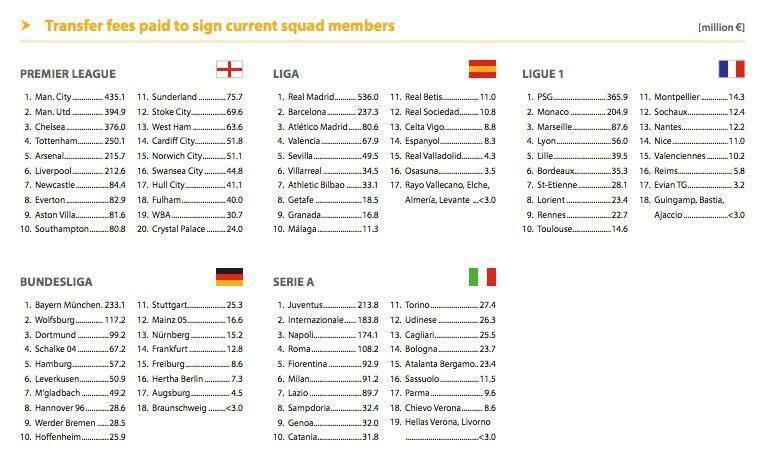 Every team has made bad transfers. You’d have to remove Fellaini from United, Torres from Chelsea, several players from Spurs, etc etc all the way down the table, and it would become a farce. If you want to do a statistical analysis of the finances, you can’t fiddle the numbers. But Villa have bought cheap yet have not bought bargain basement players , one only has to look @ how much some of the ITK’s were touting Benteke for last summer to realise that . Maybe many do not rate a lot of of the players Lambert has bought in , but how much is that because of the price tag around their necks ? Benteke’s value did not rise significantly untill after last Jan’s transfer window .The value of young players is not the price paid for them , but their value to the team & others who would try to buy them . Well, generally speaking, the bottom line to the figures is, you win the league (or come second) if you pay for it! In terms of the Premier League, the top 10 teams in this table are pretty much the top ten teams in the current table. Of course, we are only dealing with the transfer fees here and there are several other factors to take into account, if you want to get serious about it. You’re assuming that spending causes league position, but it’s equally true to say that league position causes spending, i.e. if you finish higher up the table then the clubs expectations are higher and they increase their transfer budget. Look at a team like Portsmouth, who have fallen down the leagues and now spend much less than they used to; did they fall down because they spent less? No, they now spend less because they fell down. They should also work wages into the equation, maybe using the annual salary.